The Gaza 'humanitarian crisis' is not due to a lack of staples, but to donated supplies going straight to Hamas via UNRWA, claims report. The Israel Resource News Agency and Center for Near East Policy Research, an agency founded by American immigrant David Bedein in Jerusalem retains local professional (read that "Arabic speaking") journalists who cover UNRWA facilities in Jerusalem, Judea, Samaria and Gaza, producing stories about UNRWA, Hamas and the PA.
Bedein reports that a study he did of memos from UNRWA to Holland, the US, Canada, Australia and the Israel Civil Administration over last year, shows that UNRWA gave assurances that new textbooks and the atmosphere in UNRWA schools would now reflect peace advocacy. They were to be free of the indoctrination to violence which characterized both the previous UNRWA school books translated by the agency and the contents of talks with UNRWA students interviewed over the past few years. The news agency's local journalists recently acquired the 2018 school books provided by the PA for UNRWA and have checked the contents thoroughly. A report on the textbooks and the screening of two short films of interviews with UNRWA students will take place at the Jerusalem municipality on Thursday, February 8, at 4:30 p.m.
Arutz Sheva received a preview of the report, which shows that except for two pages about peace in new PA/UNRWA school books, UNRWA indoctrination continues, in all UNRWA schools, UNRWA school books and the UNRWA public domain. 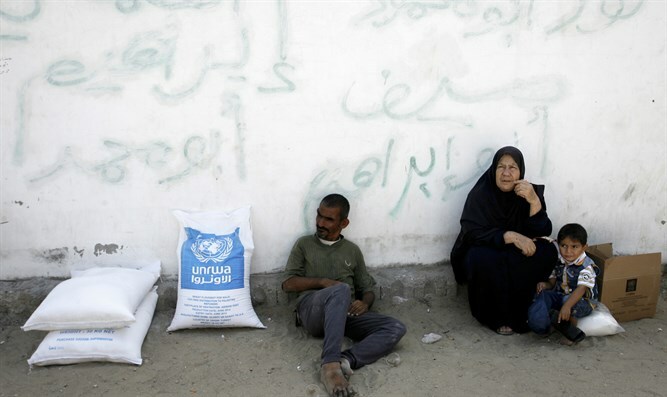 It also reveals that although 68 donor nations continue to pour food, medicine and cash into all UNRWA camps, the UNRWA workers union, under tight control of Hamas for the past 18 years, hoards all humanitarian supplies, while contracting foreign press to witness and record a staged UNRWA humanitarian crisis. "If there were a UNRWA Universal Studios, they couldn't do better," Bedein quips. Speaking to Arutz Sheva about his findings, Bedein said he is pushing for transparency, a concern of all the donor nations. He suggests that the foreign media ask their stringers on the scene in UNRWA to file stories which portray the stolen food and medical supplies that do not get to the people who need them and for whom they were sent. Will one news agency assign their UNRWA based stringers to film in real time what happens to humanitarian aid when it arrives to UNRWA? Will someone organize a tour of UNRWA facilities for donor nations to examine allegations of disappearing humanitarian aid? He concludes:"When you realize that UNRWA is an agency with a $1.2 billion budget, perhaps the most apt question is: Where has all the flour gone?"